I won’t lie and say I’ve never clicked on one of these titles just because it caught my attention. I have, and probably will again. Yes clickbait titles have a novel effect, but in the long run it’s the meaningful content that lives way past its publication date (like Mr. Gatsby). I’ve put together some methods top online publications use to boost their traffic without needing to revert those cringing titles we hate to love. Yes, you’ve probably heard this before, but I cannot stress it enough – if you don’t invest in finding out about your readers you are losing out on valuable traffic. One of the first things to get right when producing content is to understand your audience. By knowing (and I mean really knowing) your niche market you will be set to generate the right content to reach them and their networks. Are You B2C or B2B? That is The Question! There are slight differences in the content marketing approach when it comes to B2C or B2B publications. It is good to stick to either of these, as attempting both can get you and your readers frustrated. When you know what your niche is and where you want to develop, it can give you a clear path of where to invest your efforts. This graph, from the report carried out by Content Marketing Institute and Marketing Profs, shows you the multitude of content that you can create to draw in traffic. 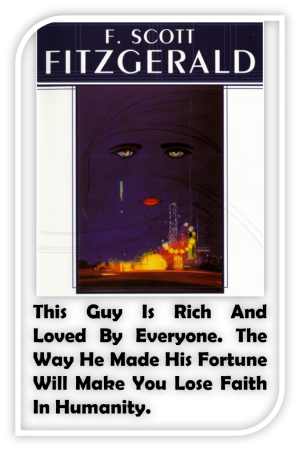 To be honest, there is no big secret to getting inside your reader’s head. Create surveys that asks questions about their interests and reading habits. You can gauge a lot of information through this method, including if they’re using mobile or desktop browsers, or how many articles they’re reading per day/week. I like using SurveyMonkey and Zoomerang, they’re free and bring great results. Attending events where your audience is likely to be is a great way to get to know them personally. When you connect with someone at a conference have a ready-made survey to go over during a coffee break. You’ll be surprised to hear what people tell you face to face. It sounds boring, but this is the bit which will stand you out from the rest. Remember that any questions you have about your audience, there may already be research in the field. Make sure to keep track of trends and opinions that are circulating, for example in the office we love reading the Moz blog (a recent post about content research from the Moz blog might help you with your market research) and Matt Woodward (because he also loves SEO, like us). When you understand your audience you will be able to produce great content that is meaningful. It’s that simple. It’s worth your time to invest in creating rich content that will show your knowledge in a topic and be useful to the reader. What a lot of people do is they take a popular topic and go into more depth about the points it makes. This method will not only increase your authority on the subject, it’ll also help your SEO. 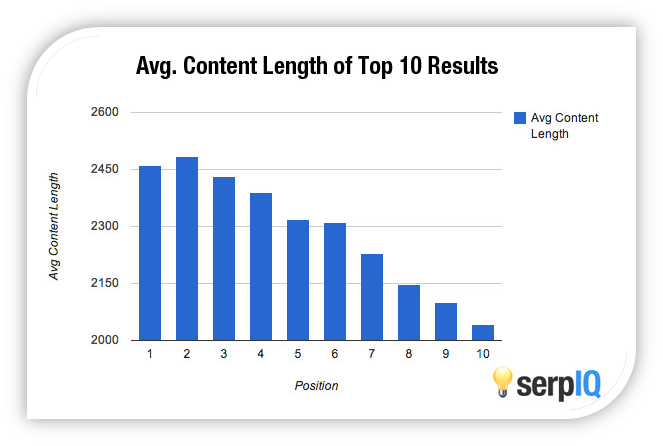 If you didn’t know that 2,000 word articles + have higher SEO than 1,000, check out the graph from what SERP IQ who show the SEO ranking in relation to content length. It makes you think what influence your 1500 word articles have in the SEO world. Create a conversation – By using ‘I’ and ‘you’ it enables the reader to connect with the content and the author. Asking questions and answering comments is a great way of building your fan base. The more people see your publication as being personal, rather than a machine, they are more likely to share the content in their network and increase your traffic. Use unique images – it is so important to use images that relate to the content and are eye catching enough to get the reader to engage. I like to use images that give more information to the reader which supports my posts. I think this helps support the statements I make with reliable research. I use this list of 74 free stock photo sites from Canva when I started searching, now I have my favorites. Catch readers off guard – When you are looking to increase traffic you sometimes have to say controversial things. This creates buzz and interest, whether people agree with you or not. But first do your research, you don’t want someone to make a comment and knock you down because you got some facts wrong. There are many ways you can increase traffic from your content, and one of the ways is social media. a) Share your posts more than once. To make your workload lighter, have a social media distribution tool that automates the process for you. I like using Oktopost as it gives me access to multiple social media accounts across our company employees. b) Build a presence on social networks. You’ll be surprised at how much traffic you can bring in by sharing your content in the right groups. Facebook, LinkedIn and Google + are the main ones, but also Scoop.it is a great platform to try out. c) Create a great headline as this is the first reason someone is going to share your post. Avoid clickbait headings and try out title tagging. This is the tag that Google uses to display your content in the search engine. Find out more about title tagging from this great tutorial from Search Engine Watch (they know what they are talking about). Forget about the usual sharing content in your network, start with getting people to share it for you. If you have written a statement that is worth tweeting, why not help your readers out and make it shareable. This video from Leah Kalamakis blog is a great tutorial if you are new to this type of formatting. Or you can head straight over to clicktotweet.com and get started. All of the above can be repurposed the other way around. Example of backwards repurposing: Recently our Marketing Director Avishai Bitton was interviewed on radio (yes those things still exist) so we transcribed it and turned it into a blog post. Check it out to see the results (and learn more about inimage advertising). There is a lot to say about supply and demand when it comes to content. When you are producing content you have to balance the frequency and length of the articles depending on the demand. You post only once a week or every fortnight. You posts are too frequent that your readers have no time to digest them. If you fall into either of these two, you might want to reevaluate your strategy. If I see an online publication that has consistent interesting content, I am more likely to return. If you don’t know what the best format is for your content calendar, go back to learning more about your audience and find out the optimum frequency to post. Another thing to consider is the location of your audience. 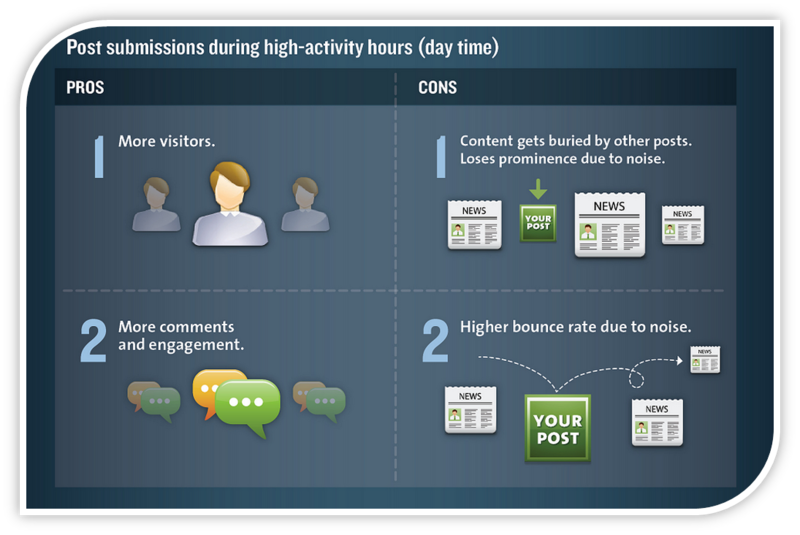 If you are writing for a US population, you need to time your posts to publish at the peak performance times. You have written a great piece of content, fantastic. But what is happening with high bounce rates and non-engagement? You have to understand that there are other variables that are affecting the time spent on your work aside from the quality of the content. So what is affecting your content? Remember to keep it clean. Having too many distractions around your posts will take away your readers attention and potentially stop them from coming back. Simple navigation and fast page upload times will give your site the quality it needs to bring in more traffic. I wrote a nice post that covers all the fine details that you might want to consider as an online publisher. Some sites change the theme to gain more traffic after consulting user experience professionals. Be careful if you are tempted to make the jump, inevitably you will have some subscribers that will not be happy with any change you make. To get them on board with your vision, make sure that your site is functioning well and is based on your specific audience needs. Again it comes down to knowing your audience. I just found my next post inspiration. Let’s face it, online publishers need to use advertising to earn money and to keep producing great content. But when a site is saturated with heavy ads that do not bring anything of interest to the reader it has a negative traffic reducing effect. If you didn’t know – imonomy is an in-image ad tech company that can help solve this issue. Using our technology online publications can place targeted ads that are contextual to the content inside their images. This industry is growing fast as many publications want to make reading as clean as possible for their users. If you are interested in monetizing your images, contact us. We are a friendly bunch– I promise! Increasing your subscriber list is a sure fire method to organically grow traffic to your content. These are people that have already arrived at your site and LOVE your content. Catching these people is part of the battle. If you check out your traffic stats, you will probably find that you have higher numbers reaching the home page, rather than individual content pieces. Because people often don’t have time to read everything and might be interested to see what you provide as a bookmark for future reading. You should think about including sign up forms and exit pop ups as a method to increase your subscriber list, especially on the home page. 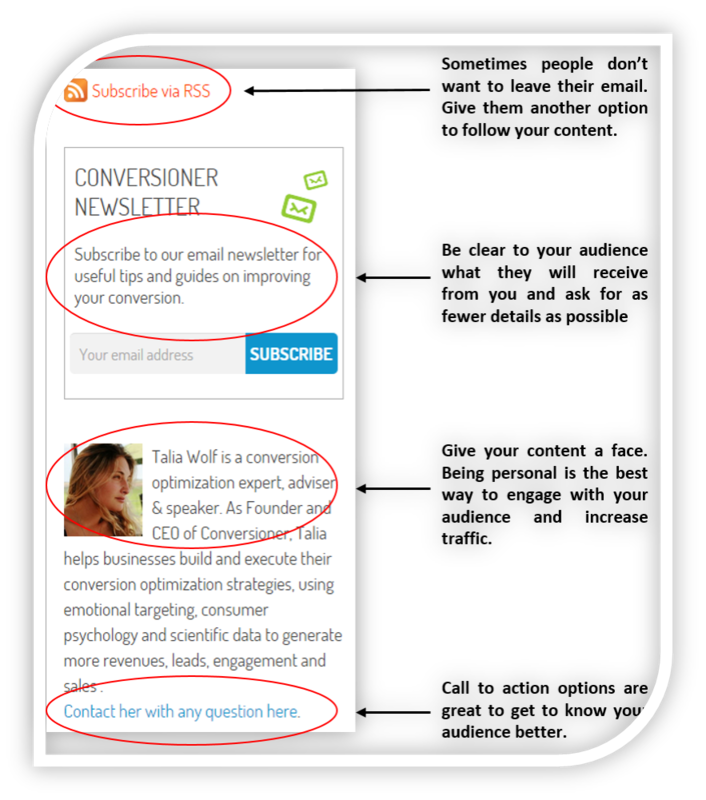 Here is a great example from Conversioner’s blog that combines both subscriber box and personalization, which is known as a way to increases people’s willingness to submit their emails. I covered a lot of the areas for increasing traffic to your site and there are others that are just as important. Understanding your Google analytics (Roojoom’s team wrote a great post that will help you understand bounce rates – I recommend the read! ), having a social media strategy and guest posting on other sites are all examples of other ways to increase your traffic. My personal tip for success: You need to understand the direction of your online publication in order to find the audience goldmine. What is your personal tip for gaining more traffic? I’d be more interested to hear if there is an area that wasn’t covered.